This is the area of gamerisms that we call poker card games defined. It's a grouping of 12 other card games that don't quite fit in our poker glossary or rummy skill game units. Although most are poker derivatives and certainly skill games, these card games are generally not available at land-based casino/poker rooms, but perhaps online. This group could be categorized as kitchen table games, cards played by young players and games that, while you may not have played for a while are sure to bring back fond memories. gamerisms knows that there is a large group of passionate card players worldwide and as our mission is to provide information and options for game players visiting the site, so poker cards games defined was created. The order of the poker type of card games is wild card, jackpots, stud derivatives and lastly, odd and unique poker variations. We will go wild first. are exciting because the wild possibilities can bring an entirely different hand. Progressive jackpot information is included in this type of game. As the name implies with this wild card game, all four Deuces are wild. This popular wild card poker game designates 9’s and 3’s as wild, therefore 8 wild cards per game. Once a 3 is dealt face up, that player must match the pot or drop out. However, when a 4 is dealt face up, that player gets an additional card face down. This game designates 5’s and 10’s as wild. Players receiving a 5 face up pay 5 chips to the pot or drop out, while those receiving a 10 pay 10 chips or drop out. This wild card game begins with 5 cards dealt to every player plus another hand of five cards face down is placed on the table. Each of these tabled or board cards are turned followed by a betting round after each is revealed. Players then build their final 5-card hand using held cards and the tabled cards. 4 cards are dealt to every player face down at this wild card game. A 5th card is then turned face up in the center of the table and is designated as the community wild card for all players. Additionally, all cards of that same rank are also wild. After betting, each player can than draw to his/her original 4-card hand of up to 4 cards and discard all or part of the hand. In an interesting twist for this game type, players are dealt their first 2 cards face down, at which time; they pick 1 card to be shown face up. Once selected, the other hole card is now wild and betting proceeds. A 3rd card is dealt and another pick is determined by the player as to which of these 2 cards will be revealed and which card is wild, followed by betting. Picking and betting proceeds until each remaining player’s hand holds 1 wild card with 4 cards showing. The unique feature of this game is that the wild card held by an individual player is also wild for all other cards of the same rank. A winner is declared after the final betting round when all cards are shown. Jackpots can be offered with wild card games. After dealing and antes placed, players vie to open or make the first bet. However, no player can open unless he/she is holding, for example, a pair of Jacks or Better. If all players are unable to open, there is another ante and another game begins. If a player opens, the game proceeds as follows: betting, then each player decides to drop, call or raise as the game continues. In Jackpots, the player who opens must show his/her openers, but not the entire hand, before discarding. Similar to Jackpots, but if no player can open with Jacks or Better, the next round will be Queens or Better, etc. In some instances, players will progress up to 2 pair or better. Stud is played more than draw poker because increased betting rounds in turn increases the pot size. Players’ hands are dealt 1 card down and 1 card up and the highest card up places the first bet. To proceed, the player with the best poker hand face up makes the call to bet, fold or check. Three more cards are dealt face up in 3 separate rounds of play followed by betting. Players remaining then reveal their hole card and the higher hand is the winner. Players are dealt an extra card face down after the fourth betting round at which time the remaining player(s) pick 5 of 6 cards as their best hand and a winner is declared. Players are dealt an additional card either up or down. The card game is a 5-card draw derivative where the low hand wins. Straights and flushes count as high hands; therefore, the best possible hand is 2, 3, 4, 5, and 7. Each player receives five cards face down. After betting, a player is permitted to draw up to five new cards. Once a player receives their new cards and a final round of betting occurs, the low hand is declared a winner. This poker game begins with a 1-chip ante and every player receives 5 cards. The rest of the cards are set in the center of the table available for draw. The first card is drawn by the player left of the dealer who may keep or discard the drawn card. A player can knock after their turn. All other players then receive one turn and choose one of 3 options—drop out, stay in or pay the knocker 1 chip. If the knocker has the winning hand, all other remaining players pay the winner 2 chips. A tie splits the winnings. Should the knocker lose, he/she pays all players remaining two chips. For this poker variant, every player is dealt 3 cards face down, arranges the cards in order and cannot change the order once set and then bets accordingly. The game proceeds with 4 additional cards face up followed by betting rounds after each card is revealed. Every player then reveals 1 down card, bets and reveals a 2nd down card and final betting. Remaining players reveal their final down card and a winner is determined. Two cards are dealt to each player and there is no draw. The best possible hand is a pair of aces. This is the most entertaining poker variant of the dozen and can be played by as many as 52 people. Each player is dealt 1 card face down and all together now--all players pick up their card and hold it on their forehead. Therefore, you can see all other players’ cards, but not your own. One betting round completes the game and a winner is declared. 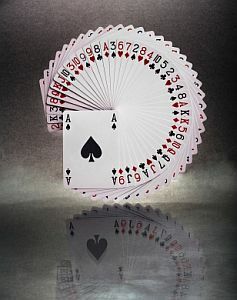 If the same card rank is held by more than 1 player, 2 options are the pot is split or the winner is declared as follows: spades, hearts, diamonds and clubs. The game of poker offers many versions and multiplayer games to include Razz, Caribbean Stud, 5 Card Stud, SitNGo, Red Dog. H.O.R.S.E. and Let It Ride.